There are a lot more high handicappers out there than players than low handicappers. So why is it that all we see on TV are ads for the ProV1 when we watch a tournament? Chances are you aren’t swinging the club like Phil, Tiger, or even the 500th ranked player in the world. So why use the same ball as them? High handicap players need different golf ball characteristics than low scoring players. The good news is that golf ball manufacturers are starting to realize this and they are producing high quality balls that work with the swings of everyday players. If you are just starting to play golf then you may also want to check out this list of golf balls perfect for beginners. Just because you tend to shoot higher scores doesn’t mean you should be using cheap golf balls or giving up control around the greens. You can still find quality golf balls that give you the best chance to score well. The good news is that golf ball companies are starting to realize that golfers just like you are looking for a ball that works for you. The quality of the options on this list below are evidence of that. There are a few factors that high handicappers should be looking for when selecting a golf ball. You may have some additional specifics, but these factors are a great place to start when choosing a ball. If you are a high handicapper than one of the main reasons you lose strokes is probably wayward long shots and lost balls off the tee. The reason for that is difficulty preventing sidespin on those less lofted clubs as well as longer carry distance with the driver. You should be looking for a ball that will minimize side spin on longer shots that are more likely to veer off course. In addition to minimizing side spin, less backspin off of the driver will also help the ball carry farther. It would be a little too complex to go into the details of how spin affects distance but for a high handicap player, less driver spin is almost always a good thing. You can make swing adjustments to accomplish this but until then, having a ball that helps you out can be very beneficial. The problem with premium golf balls is that they are typically designed to give better players more control, especially around the greens, but that results in unwanted side spin on less then perfect hits from higher handicappers. What follows are hooks and slices. Better players have learned to control that spin and use it to their advantage. But if you haven’t gotten to that point yet, then spin can be detrimental to your game. The problem with minimizing spin overall is that you lose a lot of control with your short game shots. Let’s face it, if you are shooting in the 90s and 100s then you aren’t hitting a lot of greens in regulation so pitching and chipping is more important to you than it may be for a scratch golfer that hits 15-16 greens in regulation every round. 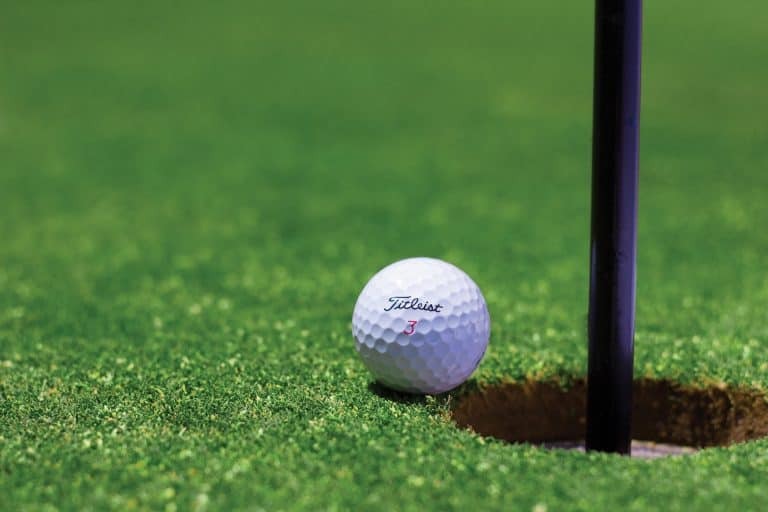 For years, players had to choose between high end premium golf balls that enhanced spin or rock hard low spin “distance” balls that were great off the tee but would roll off the back of every green…even on a perfectly played mid iron shot. That is what is so exciting about some of the more recent additions to the golf ball lineups of the major companies. They are finally putting some effort into designing a golf ball that helps prevent wayward tee shots but also gives you good greenside control. This is where the urethane cover comes in. Urethane is a more expensive material than its commonly seen alternative, ionomer (also known as surlyn, a trademarked name by Dupont). Whereas spin on the longer shots comes from the way a golf ball is compressed, spin on slower speed swings like pitches and chips comes mostly from the friction between the cover and the club. Urethane is softer and easier for the grooves in your club to grip and generate more spin. Having a urethane cover is essential if you want to maximize your potential for scoring and saving par around the greens. Previously only seen on the ProV1s of the golf ball world, now you can find models with lower compression numbers, lower long shot spin rates, and a urethane cover for short game control. The last thing you should look for is the compression rating. This may be different for every player. After all, I’m sure there are high handicappers out there that also have high swing speeds. However, most high scoring players are not generating the kind of swing speeds frequently seen on the PGA Tour (or even most high school or college matches). So a lower compression rating that works for your swing speed will maximize the distance you can get off the tee. Now that we have established what you should be looking for in a golf ball if you are a high handicapper, let’s take a look at the best ones out there today. The Callaway Chrome Soft checks all of the boxes to be a premium golf ball targeted at high handicappers and players with slower swing speeds. It does carry the price tag of other premium balls but for the golfer that it was designed for (probably you), it is well worth the money. I honestly loved this golf ball when I tried it out. It had a softer feel, even off the putter, than a ProV1. 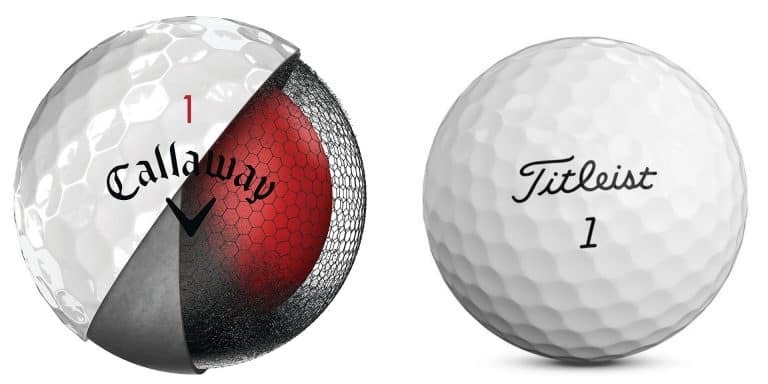 For the 2018 model, Callaway added graphene to the cover of its already popular chrome soft golf ball. According to Callway, because of the strength of graphene (apparently one of the strongest substances around), they were able to make the soft inner core larger and as a result, create more ball speed for slower and moderate swing speeds. There’s more to a softer ball than just being right for slower swing speeds. It also means that when you miss the sweet spot of the club (which higher handicappers are known to do from time to time), you can still get decent compression on the ball. That means less lost distance for off center hits. Over the course of an entire round that means your approach shots are closer on average than with a harder ball. So even if you think you have the swing speed for a harder ball, if you aren’t hitting the sweet spot almost all the time, then you are losing yards overall and making the game more difficult for yourself. By all accounts online, it appears that the 2018 version (linked above) has less spin off the driver than its predecessor. That is one of the main reasons that this ball is my top pick. The combination of low driver spin and tremendous feel is pretty much unmatched. With a wedge in hand, this ball felt like a premium tour ball. Based on the shots I took on the course, I would give the edge in wedge backspin and ability to stop on a hard green to a ProV1 over this ball, but it was a LOT closer than I thought. On your average course, you should have no trouble stopping this ball quickly with a wedge in your hand and a good strike on the ball. On the putting green, the Chrome Soft was my favorite of the ones tested. It has a similar feel to a ProV1. Kind of a deadened thud that makes you feel like the ball is sticking to the face for just a split second. It is hard to describe but it gives you the confidence to putt a little more aggressively because you don’t get that “click” off the face that cheaper lower spin balls usually have. The Srixon Q-Star Tour is a relatively new golf ball by Srixon that was made specifically for the higher handicap player that wants to play a quality golf ball. As an added bonus, it costs less than the Chrome Soft, so when you (inevitably) slice one into the woods or dunk one in the water…it won’t sting as much. This ball was the surprise of the group. So much so that I did a comparison with one of my favorites, the more expensive Srixon Z-Star. Chipping with this ball was very close to a premium tour ball. I was able to get predictable and controllable spin, even on shorter chips. One of my favorite shots is the low spinner from the fairway, but it usually doesn’t work without a premium ball as you can’t generate enough spin to stop it. The Q-Star Tour let me pull off the shot about 90% as well as with a ProV1 or Z-Star. That was pretty impressive. The Taylor Made Project (a) was one of the first balls that targeted the casual golfer specifically rather than just pro and scratch golfers. For the right player, it is still an excellent choice. The new version of the Project (a) has a core with a compression of 40 according to Taylor Made. It is still an overall compression of 70 but TM has said that the increased softness in the core should create less spin off the longer clubs, including driver. The combination of a softer inner core and a firmer outer core is supposed to create more velocity off the clubface without increasing spin. It also provides a higher launch angle. This is noticeable when I hit the ball. If my swing speed got up over 100 then there was a definite ballooning of the ball flight. But this ball is not for players with that swing speed. Between 75 and 85 it performed very well, producing a solid ball flight. Around the greens I think it fell just short of the Chrome Soft and the Q-Star Tour. For the most part this is a personal feel thing and I would recommend trying each of them out to see what feels best for you. For me, the Project (a) just seemed to have a little less bite on the short shots. For another golfer that prefers to let the ball run out to the hole on chips and pitches, this may be the perfect option. The Project (a) is around the same price as the Q-Star Tour. If I had to compare, I would consider the Project (a) more appropriate for those with slightly slower swing speeds. Let me know in the comments below if you there there is a better (or just as good) option out there for high handicappers.